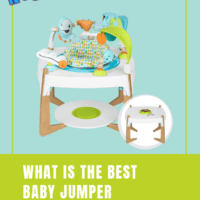 What is the Best Baby Jumper of 2019? 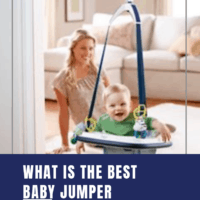 What age is safe for a jumper? How does a doorway jumper work? Can I buy a baby jumper with a stand? Babies absolutely love baby jumpers because they’re a lot of fun! Parents love jumpers too. They keep our little bundles of energy happy and entertained. And hopefully, they can burn off some energy for a good night’s sleep! 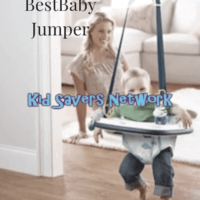 With the many varieties on the market today, it’s hard to know what is the best baby jumper. On this page, we’ll take a look at some of the best jumpers available in 2019. A baby jumper is basically a seat that your child sits in that is attached to an elastic strap. It relies on your little one to use their feet and toes to push off the ground. This creates the movement that keeps your baby having fun. Your baby can use a jumper as soon as they can support their head unassisted. Naturally, all babies develop differently but this can be as early as four months old. As always check the manufacturer’s guidelines for height and weight guidance. Door jumpers have an elastic cable and a clamp at the end to attach to your door frame. Many parents prefer this type because they take up less space. They can easily be removed and put away if need be. Some parents prefer to buy a baby jumper with a stand. They are much more portable so they’re much more convenient. Unfortunately, they are also much more expensive! We took a look at the best baby jumpers in 2019. 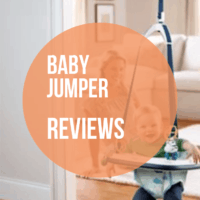 Here are our reviews of 5 jumpers to suit your budget and baby! If you’re looking for a stable doorway jumper that has sounds, you’ll love this one from Little Tikes. The Cozy Coupe is easy to attach to a standard doorframe (8ft high) with included clamps. The clamps will not mark the doorframe so you can use the “Cozy Coupe” if you’re traveling or visiting friends and relatives. The harness is also adjustable so you can move it to the most comfortable height for your baby. What sets this Little Tykes jumper apart from others is the removable dashboard. It has music, a horn, and a mirror to entertain your baby. Babies love to jump along to music so this will really encourage them. And of course, you can use the dashboard when the baby is not using the jumper, too! Something that’s on all parents mind is “Safety”. It’s important that the jumper is stable and doesn’t flip over for obvious reasons! Other parents that have reviewed this product have praised how stable it is. Little Tykes advise parents to start using the Cozy Coupe at 4-months old. Some parents have been using it from 3-months but the leg holes are a bit big. To get round this, they plug the holes with cloth or clothes. A downside to this product is you have to completely remove the dashboard to stop the music. This means you have to stop your baby jumping and makes things a bit fiddly. The Little Tikes Cozy Coupe is a very cute, stable doorway jumper with sounds, but the price might put some parents off. This model is perfect if you’re looking for a baby jumper but don’t have a suitable doorway. 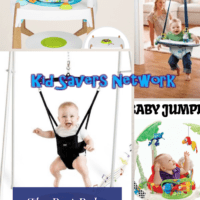 This great alternative to a door jumper helps improve a baby’s balance and develops their coordination. The seat provides great back support and it has enough spring for your little one to do some fun jumps. As it’s on a stand, you can move it all around your house without the limitation of needing a door frame. You can even take it outside. This means you’ll actually use it more and your little one will get a welcome change of scenery! Many parents also prefer this type because you don’t have to worry about the clamps breaking. You also don’t have to worry about older children accidentally shoving their jumping younger sibling. This does sometimes happen with door jumpers. 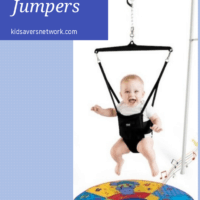 A drawback on the Jolly Jumper is that it is a high price point compared to others on our list. It also takes up a lot of space and cannot be used unless you have a good area somewhere around your house to set it up. If you’re looking for a jumper for a baby that can be taken outside, this is the one for you! The Graco Bumper Jumper is great for a baby who is learning to sit up all on their own. They’ll love bouncing up and down and be entertained for quite a while. What makes this Graco model stand out is that it has a built-in toy tray. This also comes with several interactive play toys. These toys attach at each side with a ring making it easier for them to play with. It’s easier for you to as you won’t have to always pick up their dropped toys! The high back seat is very comfortable and provides a lot of support. It’s also machine washable, making it even easier to take care of. The clamp to hold it in place is spring loaded. So it’s really easy to install and you don’t have to worry about it leaving a mark on your walls or door frames. This is a godsend if you are living in rented accommodation. One of the biggest complaints is the height adjustment. Some parents report that their child had outgrown the Graco Bumper too quickly. However, what actually may be happening is that they may not be using the height adjustment correctly. Read the instructions carefully as the adjustment buckle can be a bit confusing. Also, measure the door frame where you are hanging the product. If your molding is higher than 6” from the door, the clamp will probably not fit. This is probably the best doorway jumper for infants around the 4 – 6 month age. The Merry Muscle is an ergonomically-designed jumper and was created by an occupational therapist. 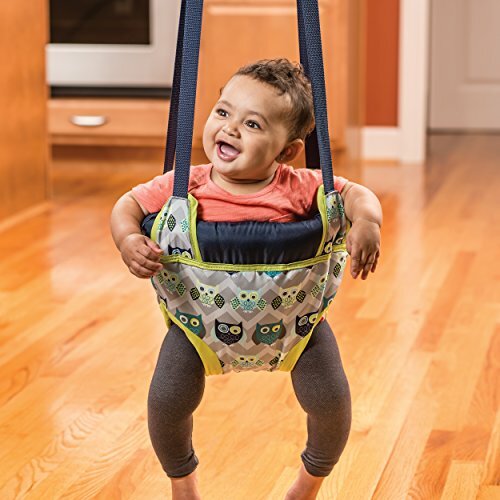 The Merry Muscles Jumper keeps your baby in the most optimal position to learn how to walk. It does this without putting any harmful pressure on vital organs so it’s more comfortable. It also allows your baby sit at an angle where they use the soles of their feet to push off rather than their toes. This helps prevent tip-toe walking later on. This Merry Muscle jumper provides full head and spine support. This allows your baby to use it from as early as 3 months old. The weight of your child is supported by their buttocks and upper thighs so it really prepares their little legs for walking. A drawback with this one is that you do have to screw in the hook for installation. It is a more permanent fixture in your home so you can’t take it down as easily or bring it with you to other homes. A doorway clamp is available as a workaround. Like many jumpers, it also takes a while to get the hang of placing your baby correctly in the carrier. This Evenflo model is perfect if need a portable jumper. You can hook and unhook it to any door frame with its secure door frame clamp and it packs small giving you the ability to take it with you anywhere. Its seat is fully framed giving your baby great sitting support. The spring is enclosed to help prevent your child from touching it, which is a great safety feature. The framed seat pad is also completely removable making it easy to clean. You can easily wipe it down or put it in the wash.
One of the drawbacks is that it is not as bouncy as others on our list. 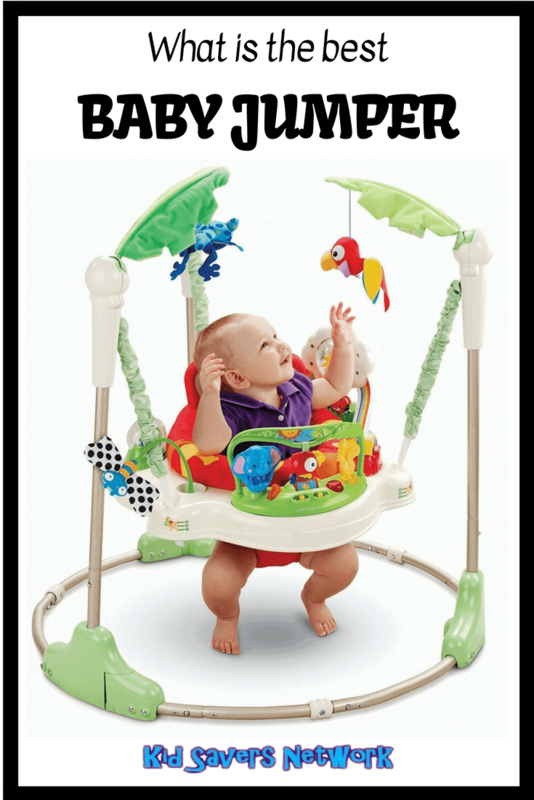 There isn’t much spring in the bounce that your little one can use. It is also hard to get your child in and out of it. Taking that into account, we still believe this the best portable baby jumper around in 2019. If you enjoyed this post, you’ll also like our review of the best exersaucers of 2019, too!